Welcome to week 3 of my blog post series, How to Start & Grow Your Email List! So far, we’ve talked about the importance of an email list and ways to grow your email list, but today we’re covering how to create an opt-in freebie your audience will love. You’ve probably heard it all before…”the money’s in the list” and “your email list is the most important part of your business,” etc. It may have gotten a little tiring, but it’s true. 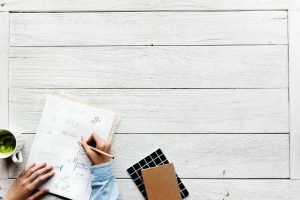 As a blogger or online business owner, you need an email list! While this may be true, most bloggers and creative entrepreneurs don’t put their focus on growing an email list when they’re starting out. In fact, many say not starting an email list sooner is one of their biggest regrets. Instead of building their email list, they invest their time into growing a following on Instagram or Facebook. Yes, I’ll admit growing a social media following is important too. After all, social media is essential to promoting your blog and business. But, there are two reasons social media comes in second to growing an email list. Thanks to the ever changing algorithms, getting your content in front of you audience is harder than ever. Only a small percentage of your followers see what you’re posting every day so the chance they miss out on important content is sky high. Unless you’re willing to pay to boost your posts, that is. You may spend hours each month planning your content and perfecting your captions, but the truth is it could all disappear in an instant. Whether someone flags your account as spam, you get hacked, or the platform shuts down you could lose your content and your followers in the blink of an eye. How will you contact your followers if your lose access to your social media or you need to relay important (time sensitive) information? When someone opts in to your email list, they do so because they connect with your message, find your content helpful, and get something in return. Best part – you own your email list. 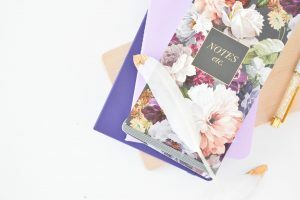 Since starting my blog, I’ve had a lot of luck growing my email list using a downloadable opt-in freebie that correspond with a blog post, aka a content upgrade. 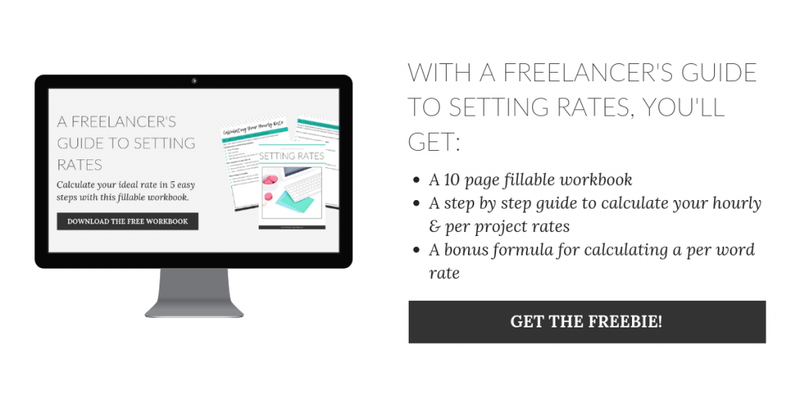 For example, I offer a fillable workbook as a content upgrade for my blog post on setting freelance writing rates. 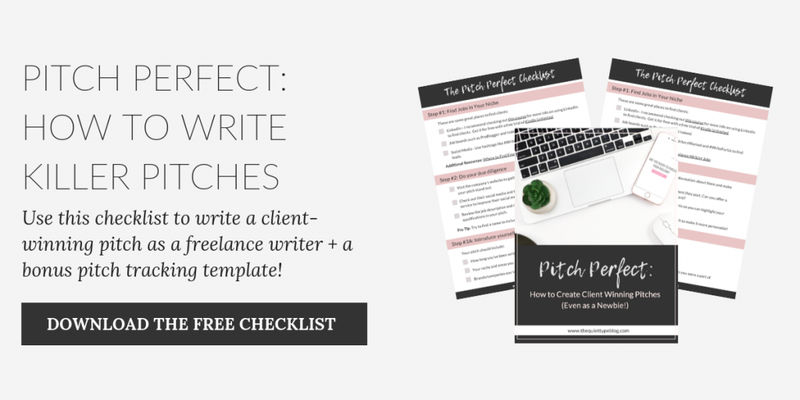 My blog post on writing client-winning pitches offers a checklist and a bonus pitch tracking template as a content upgrade. I will be the first to admit, creating an opt-in freebie can be hard. Thinking of the perfect opt-in freebie idea can be stressful and cause you to second guess whether or not what you have to share matters to your audience. You have to consider what the freebie is about, what kind of format it should be in, how to deliver it, etc. 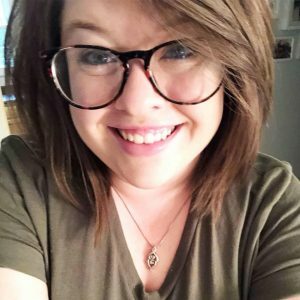 I’m here to tell you your opt-in freebie doesn’t need to be perfect. The purpose of an opt-in freebie is to solve a problem or make something easier for your audience. But how do you know what that is? There are three different methods that will help you figure it out. First, think back to when you first started out. What did you have trouble with as a newbie? Was there information you couldn’t find by hitting up Google? For example, let’s say you noticed there’s a lack of information on how to create a freelance writing resume. You could help to fill that gap by creating a checklist or template for your audience. The next method is to survey your audience. This is super easy! Send an email to your existing list (even if it’s small) to see what they’re struggling with. You can do this either by sending an email asking for their reply, or you can create a survey for them to complete. I like to create my surveys using Typeform or Google Forms. Once you’ve gotten responses, you can build your opt-in freebie around the struggles of your existing audience because if they’re struggling with it, others probably are too. Finally, if you’ve joined Facebook groups related to blogging, freelancing, or entrepreneurship you can use them to look for patterns in the questions people ask. Just browse through the posts in the group to see if there is a common theme in the questions. If you’re having trouble finding anything, ask the group what they’ve been struggling with. Once you’ve identified a few pain points, you can brainstorm how to convert them into an opt-in freebie. You can also use the second and third methods to gauge the interest in your current opt-in freebie idea. Simply send an email to your list or create a post or poll in your Facebook groups asking if they’d find the information helpful. Once you’ve decided on the problem your opt-in freebie is going to solve, it’s time to pick a style/format. What will be the best way to format your freebie to give it maximum impact for your audience? It’s just a matter of finding the format that works best for your freebie. Having a title that accurately depicts what your freebie is about will help you promote it. Think of something catchy and easy to remember. Keep in mind your opt-in freebie title will be used when creating landing pages, opt-in forms, and to create pins and social media posts. It’s time to bring your opt-in to life! This might seem like the most daunting part, but just remember, it doesn’t need to be perfect. You can always fine tune your freebie based on the feedback of your audience. If you’re not good at graphic design or have limited time to create your freebie, one of the best things you can do is invest in a template. I’ve used templates to create both of my freebies and it made the process a lot less stressful! In my opinion, the best place to find opt-in templates is on Creative Market. You can find all kinds of templates on Creative Market, but I mainly purchase Pinterest templates and opt-in templates. 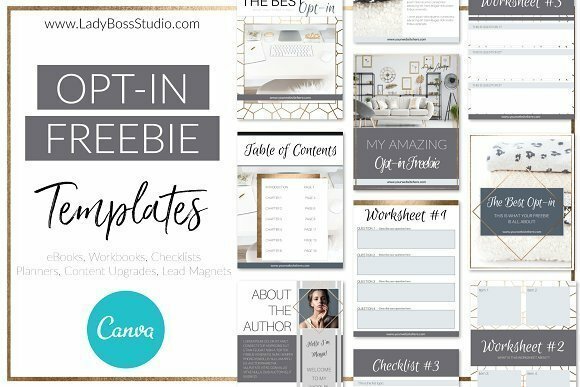 Here a few of my favorite affordable opt-in freebie templates. The templates save me so much time and they’re easy to customize but you have to make sure you get the right version of the template. 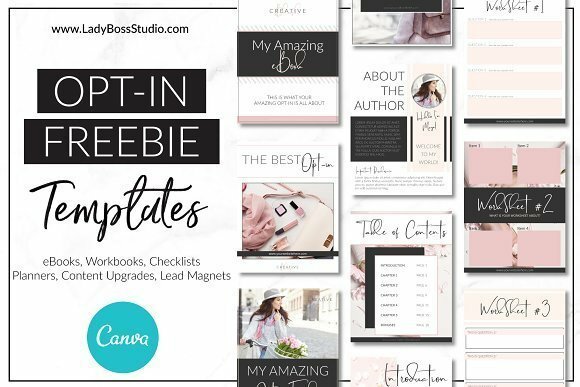 For example, I use Canva to create my freebies and pins, so I always purchase the Canva format. For email courses, you’ll need an email service provider like MailChimp (free up to 2000 subscribers) or ConvertKit. Just like when you create graphics for your blog, social media, or Pinterest, you want to stay on brand with your design. Doing so creates brand recognition, which establishes credibility with your audience. Take it one step further and include your business/brand name in the file title and alt-text. People tend to sign up for a lot of freebies, so having your information in the file name helps them easily identify the source. It’s not enough to just create your freebie and hope for the best. You need to promote it! 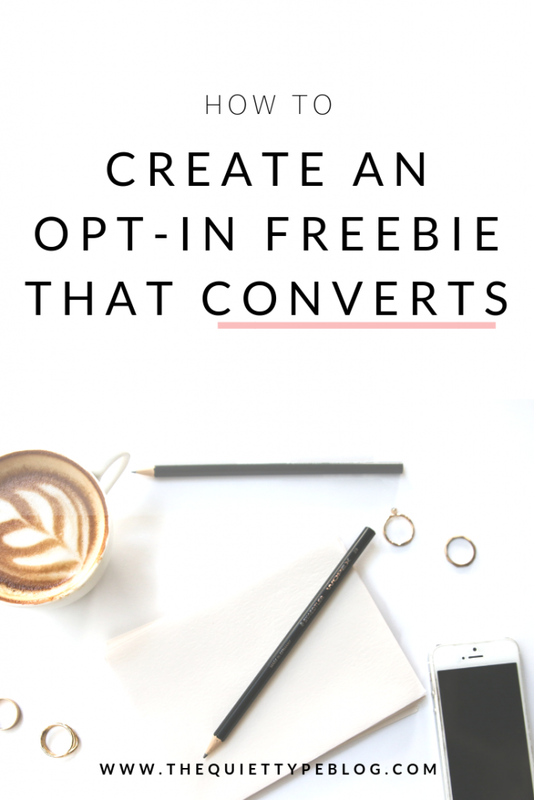 To deliver your opt-in freebie, you’ll need an email service provider like MailChimp or ConvertKit. How you set it up will depend on your provider, but most will send the freebie to your new subscriber instantly. So, now that you know the ins and outs of creating an opt-in freebie that your audience will love, there’s only one thing left to do – get creating! Remember, your opt-in freebie doesn’t need to be perfect right off the bat. Learn from the feedback your new subscribers offer and tweak your freebie over time. The important thing is getting something out there so you can start growing your email list! Don’t forget to check out the other blog posts in this Email List Series! Coming up next, 20+ ways to promote your opt-in freebie!